Happy Bloggers Challenge Friday! Thanks to those who played along with last weeks Alter It Challenge, I always love to see what other people are altering! This weeks Challenge theme is Farm Fresh. The new August Releases from Our Daily Bread Designs are just perfect for this weeks Bloggers Challenge theme! 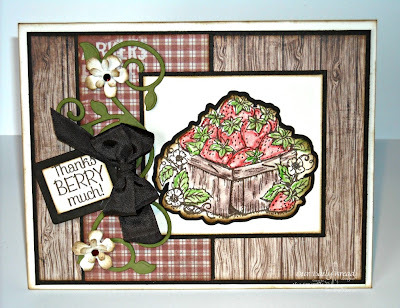 ODBD is now also selling Cut Files for select stamp sets, here I used the Silhouette to cut the panel for the Strawberry Basket, then using a SAMJ stamped the Strawberries in Coffee Archival. The image is colored with STAEDTLER Karat Watercolor pencils. I created an offset panel using the Silhouette, cutting from Espresso card stock to mat the strawberries. To embellish I die cut and embossed the swirl from the ODBD Fancy Foliage Die from Olive card stock, and added flowers cut from Vanilla card stock using a Memory Box Die. The sentiment is stamped in Coffee on a Vanilla panel, then layered onto an Espresso Tag that was cut using the ODBD Recipe Card and Tags Die. If you'd like to play along with this weeks Bloggers Challenge, please link back to this post on your blog and mention you created your card for the Bloggers Challenge Farm Fresh Challenge. Please add your link using the Link Tool below, your link should be a direct link to your Bloggers Challenge Post, use your name as the Title. Please do not link to cards that were created prior to the challenge date. Entries not linking properly, or backlinked will be removed. If you have the captcha enabled on your blog, please consider turning it off, as it makes it so much easier to leave comments. Just beautiful, Lisa! Love the offset mat behind the image--it really makes the image stand out. Great use of the perfect papers for that full "farm" feeling with the berries! Such a lovely rustic look!